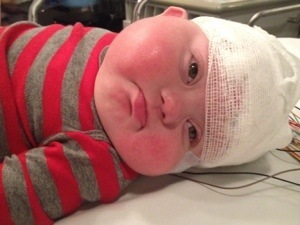 Eli had his follow up EEG today. His neurologist said everything looked perfect. All brain activity is normal. Woo hoo! Praise the good Lord. He will be off all medication in two weeks. There is no plans for a return visit to the neurology department unless the seizures return. Infantile Spasms can re-appear but we will remain hopeful that the seizures are a thing of the past forever…Soon to just be a distant memory. Eli is especially happy not to have to partake in any more EEG’s. He is not a fan. I am so thankful that this whole process was relatively easy compared to some of the horror stories I’ve heard about. Infantile Spasms are very hard to treat sometimes. We are lucky that we caught them super early, treated aggressively right away, and got the whole thing under control within 3 weeks. I give thanks to the doctors who supported us throughout this process, most notably, Eli’s pediatrician Dr. Partridge. She took me serious from the get go. I am forever grateful to have such an amazing professional support system in Eli’s corner. Go team Eli!!! It is awesome to see him reaching so many milestones now. He rolls over from back to front and from front to back. He can sit up unassisted for a couple of seconds. He reaches up when he wants to be held. He can sit in a high chair, a Bumbo, and an activity jumper. He may be a little behind at reaching some milestones but he is catching up at record pace! He is a determined baby that is for sure. 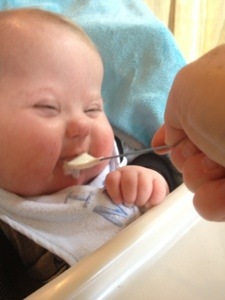 Eli also had his first taste of rice cereal on Mother’s Day. He definitely seems to enjoy it! Next we’ll try fun stuff like applesauce, bananas, and squash (those were Cody’s favorites)! I’m excited to have my baby back!!! Thank you all for prayers, love, and support. This road would be a lot harder to travel without so many of you routing us on! I am so, so, so proud of our boy for getting through another challenge. He inspires us daily. As always, we are truly blessed. An estimated 8-10% of babies born with Down syndrome end up with a seizure disorder called Infantile Spasms (www.ndsccenter.org).There are around 6000 babies born with Down syndrome each year. So, 600 of those babies will also have seizures. Sadly, Eli is one of those 600. We confirmed yesterday that he has Infantile Spasms. The good news is that we caught it early – very early – so we can start aggressively treating the seizures. It’s been an emotional week. Last Wednesday, the day after we got home from our most recent hospital stay, I noticed Eli was having what looked to be startle reflexes. But startle reflexes are a newborn thing and Eli is not a newborn. 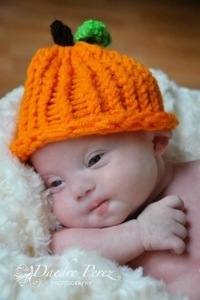 I had heard about Infantile Spasms from some of the mommies in our local Down syndrome support group. It was one of the things I prayed Eli would not have. The seizures cause developmental regression and mental impairment. You can learn more about Infantile Spasms here. I immediately googled Infantile Spasms and Down syndrome and knew with almost certainty it was what I was witnessing in Eli. Noah’s Dad (a popular blog by a dad of a boy with Down syndrome) had some wonderfully informative information (with video) on his site. Comparing the video to what I was witnessing in Eli, I just had that gut feeling (mother’s intuition) that this was serious. I had a bronchiolitis follow up appointment with Eli’s pediatrician, Dr. Partridge, on Friday. I mentioned my concerns. Thankfully, she took my concerns seriously and sent in a referral for an EEG at Children’s. On Easter Sunday, Eli had 50+ little seizures/spasms within 5 minutes. It was terrifying. I texted Dr. Partridge and within minutes she was on the phone with the on call neurologist at Children’s (have I mentioned lately how much I love Eli’s amazing pediatrician?!?). He advised that they wouldn’t do an EEG on the weekend so, instead of ruining our day just to sit in the hospital, we should continue monitoring the seizures and try to enjoy our Easter (which we did, especially for Cody’s sake!). The neurology department called on Monday (after Dr. Partridge called them first thing in the morning to insist Eli be seen ASAP) to schedule an EEG and consult. We went in for the EEG yesterday. Poor Eli did not like being kept awake the entire car ride to the hospital just to be told to sleep for the EEG then woken up to “perform” a seizure (which of course he didn’t do because babies and pets never do what you bring them into the doctor or vet for!). He also didn’t like having all of the electrodes ‘glued’ to his head! After reviewing the EEG, the tech spoke with the neurologist and informed me that “they had enough information” and “they didn’t need to witness a seizure” (I knew that wasn’t a good sign). We met with Dr. Gospe (the head of Neurology at Seattle Children’s) along with Dr. Beatty (resident/fellow) who informed us that Eli did, in fact, have Infantile Spasms. We discussed the three treatment options (injectable steroids, oral steroids, or a combo of anti seizure medication and vitamin B6). I had done my research prior to our appointment so I knew that children with Down syndrome have responded positively to treatment, especially the injectable steroid ACTH. I told them I wanted to treat this aggressively and hopefully be successful the first time. Many people try the oral steroids or anti seizure medications first and if that doesn’t work switch to ACTH. Since we caught these early, I want to stop them quickly – before too much damage has been done. Eli has currently showed no signs of regression. My hope is to keep his development on track. The doctors agreed that ACTH would be the right course of action to best treat Eli. ACTH is a ridiculously expensive ($10,000 a vile!) drug so there are a few hoops to jump through before being approved to start the therapy. Eli is scheduled to be admitted to the hospital on Friday. He will be given the injection and monitored. Over those next couple of days we will be educated on how to inject him at home. He will get a once daily injection until the seizures stop. Once we have observed that the seizures have stopped physically for 4-5 days, he will be given another EEG. If that shows that the seizure activity has stopped in his brain as well, he will be weaned from the medicine. We have been advised to expect weight gain, extreme puffiness, irritability, an insatiable appetite, and sleeplessness. Obviously, none of that sounds fun for Eli or our household. I have also been told (from other mommies) to expect the Eli we know and love to “disappear” for a month or two. One gal said she didn’t see her child smile for months! This is what saddens me the most. Our boy has always smiled through the hard times – that’s what keeps us going. I am taking a lot of pictures to reflect back on when we’re in the midst of this mess. I am scared but I know this is what will save him – save his future. We can get through this just like we have leapt every other hurdle we’ve encountered with our boy. He is certainly giving us a run for our money! Being at Children’s yesterday we felt sad but very grateful. Grateful we have a support network that educated me on what to look for. Grateful for an amazing medical team who rallies around our boy and always takes this mom seriously – especially Dr. Partridge who never takes me for the crazy, overreactive mom that I am sometimes afraid I’m being. As she put it yesterday, I walked into her office and told her exactly what he had within 48 hours. Many doctors would not have taken me seriously. Luckily, we don’t have one of those doctors – we have Rebecca Partridge! 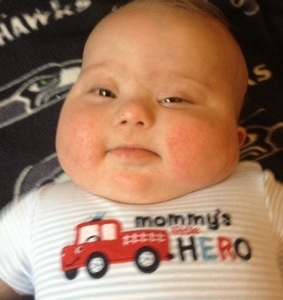 I am grateful that we have a hospital like Seattle Children’s in our area to care for our children. Grateful for the awareness that it could always be worse. And grateful for the resiliency of my son. We already know he is a fighter. It’s now time for us to stand together and tackle this terrible thing head on. Just like we have always done. Just like we always will. Together. Many people say to us “let us know if you need anything”. We don’t always know what to ask for or how to ask for it. But today I am telling you we need you. I am asking for your love and support. Eli needs your prayers. Our family needs strength. There is a Jewish Proverb that says I ask not for a lighter burden, but for broader shoulders. Chuck and I are staying strong for our family. We are carrying the burdens the best we know how. But each new setback weakens us. Your prayers, love, and support strengthen our family in ways I cannot describe. Please don’t give up on us – we need you and, most importantly, Eli needs you. He looks so cute in the tiny hospital gown!